Tony Redmond is the lead author for Office 365 for IT Pros. Based in Dublin, Ireland, Tony had a long corporate career as an executive. He has worked with email and office systems since 1982 and has written over 20 books in that time. Tony writes for Petri.com twice weekly and is a frequent speaker at conferences. Paul Robichaux, an Office Servers and Services MVP since 2002, is currently the chief technology officer at Quadrotech Solutions, where he leads the product development team for Quadrotech’s family of Office 365 migration, automation, reporting, and security products. Paul’s unique background includes stints writing Space Shuttle payload software in FORTRAN, developing cryptographic software for the US National Security Agency, helping giant companies deploy Office 365 to their worldwide users, and writing about and presenting on Microsoft’s software and server products. Paul’s an avid (but slow) triathlete, an instrument-rated private pilot, and an occasional blogger (blog link) and Tweeter (@paulrobichaux). Ståle Hansen is the Founder and Principal Cloud Architect at CloudWay in Norway. He is an Office Servers and Services MVP with over a decade of experience with Skype for Business and are now focused on hybrid Office 365. His core competence is to explain complex scenarios and make them understandable by combining technical insight and business value. He loves to share his understanding as a blogger since 2009 and as a highly rated trainer with the long running master class covering Lync 2010 to Skype for Business administration. You can follow his YouTube channel on OneNote LifeHacks. He is regularly invited to speak at international conferences such as TechEd, Microsoft Ignite, NIC and IT/Dev Connections. Follow Ståle on Twitter, and read his msunified.net blog. Ståle writes about the transition of video and audit to Teams in Chapter 16. Chief Research Officer at Sulava, Microsoft MVP and Regional Lead, Microsoft Certified Master but also a fairly nice guy to work with (in his own words). Jussi has over 25 years’ experience on the Microsoft platform. Started with a VIC-20 in 1981, so it’s been a long but rewarding road so far! Jussi has outstanding skills and understanding on the Microsoft platform, including Microsoft Azure and Office 365, as well as traditional on-premises deployments and architectures. He has been very focused on SharePoint and Office 365 for the past 10+ years. In the recent years he shifted his focus slightly to hybrid architectures and cloud-based approaches. He is able to communicate and create value on the CxO level on all things Microsoft and is one of the selected few in the world to have attained the highest technical certification from Microsoft, the Microsoft Certified Master: SharePoint, as well as the Microsoft MVP award. When he is not at a customer site or in a classroom, he is rock climbing, running or hunting great Italian wines. Brian Reid is a consultant, instructor, and author specializing in Office 365, Azure, EM+S and Microsoft Exchange Server and the UK director of Microsoft Gold Partner, NB Consult. With over 25 years of experience in Microsoft and related technologies, Brian has helped many customers to design and integrate Microsoft Exchange Server, Active Directory and Office 365. Brian specializes in helping his clients migrate to, and get the best from, Office 365, Azure and the Enterprise Mobility + Security suite. Brian also has a number of on-premises clients, and he designs and builds reliable on-premises solutions for Exchange Server, including the migration from earlier versions of Exchange (and other email system) to the latest version of Exchange or to Office 365. He is a Microsoft Certified Master and Microsoft Certified Solutions Master (MCM) in Exchange Server, one of a handful people worldwide who are both MCM certified and an MVP. Brian served as an instructor for the MCM program, specializing in email transport. He lives in the UK and is married with three children. Brian writes about Exchange message flow and online protection in Chapter 17. Juan Carlos is a Telecommunications Engineer with more than 14 years of experience in diverse Microsoft products and technologies such as SQL Server, Visual Studio, and the .NET Framework. He currently works as a Modern Workplace Team Leader focused on the SharePoint and Office 365 platforms. Juan Carlos is an Office Servers & Services MVP and co-founder and coordinator of the SharePoint Users Group of Spain (SUGES), the Cloud Computing Users Group (CLOUDES), and the Comunidad de Office 365. He is also co-editor and co-director of the free Spanish digital magazine about SharePoint: CompartiMOSS. To date, Juan Carlos has co-authored 11 books and several articles about SharePoint and Office 365 platforms in Spanish and English. Juan writes about SharePoint Online and OneDrive for Business with his fellow MVP, Gustavo Valez, in Chapter 8. Gustavo Velez is a senior solutions architect specialized in the integration of Microsoft software. Over many years of experience developing and working with Windows and Office applications, Gustavo has given seminars/training in SharePoint as well as private consultancy work. His articles can be found in many of the leading trade magazines in English, Dutch, German and Spanish. He is webmaster of the principal Spanish-language site dedicated to SharePoint. 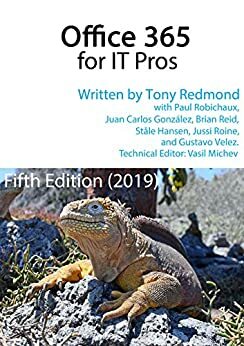 Gustavo is author of eight books about SharePoint and founder and editor of CompartiMOSS, the magazine about Microsoft technologies for the Spanish-speaking community. Read what Gustavo writes about SharePoint Online and OneDrive for Business in Chapter 8. Vasil Michev is an Office Servers and Services MVP, specializing in Office 365. He’s currently employed as a Cloud Technical Consultant, and in his free time he can be found helping others in the Office 365 community. When he’s not helping to straighten out our text, Vasil blogs on https://www.michev.info/.